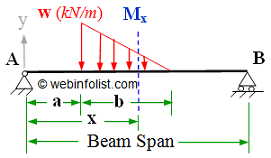 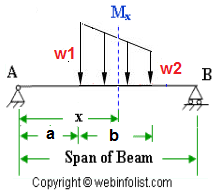 This free online Bending Moment calculator is developed to provide a software tool for calculation of bending moment and shear force at any section of simply supported beam (without overhangs) subjected to point load, uniformly distributed load, varying load and applied moments on the span or supports.This calculator uses equations of static equilibrium to determine the reactions at the supports and then determines the values of shear force and bending moment at the required section which helps in plotting bending moment diagram and shear force diagram. 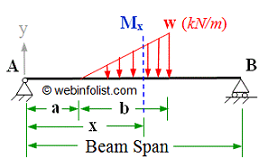 This calculator can also be used to find the ordinates of influence line diagram for structures. 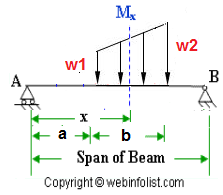 You can select from the 14 load cases given below or go to Instructions for Bending Moment Calculator for guidelines on using this calculator.